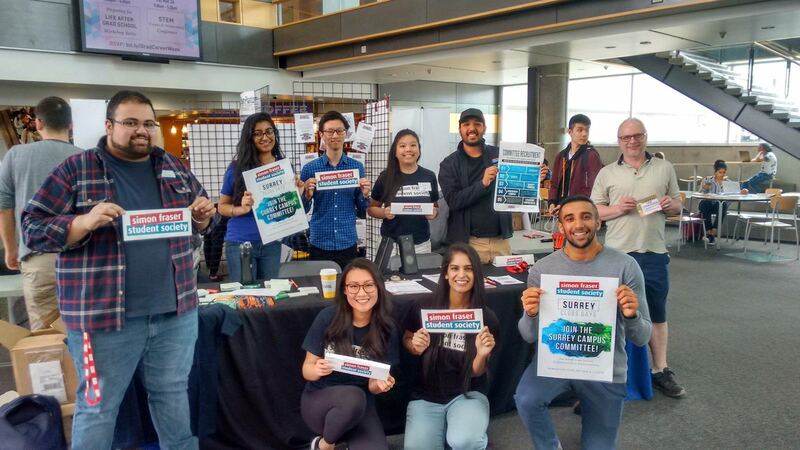 The Simon Fraser Student Society (SFSS) has reached an agreement with Simon Fraser University to expand study and space options for students at the Surrey Campus. Space improvements, dedicated project rooms, and after hours study spots are a few areas SFU will make a priority for students starting today. Nine open locations will be included in study enhancements. The proposed improvements include adding power outlets, additional overhead lighting and additional seating. The locations are included in appendix I. The project will be completed in a timely manner over the next year. Classrooms will be available for study spaces after hours starting today. All classrooms on Galleria 3 will be left unlocked until midnight, and classrooms on Galleria 5 will also be opened by Security on an as-requested, as-needed basis. Two galleria classrooms will be dedicated Project Rooms for student group work each semester starting today. The rooms will be identified each semester; due to class requirements, SFU cannot dedicate rooms on an ongoing basis. The classrooms for this semester are included in appendix II. Tools for projects will be available through a mobile cart from SFU. The locations of the rooms will be communicated by SFU each semester. SFU Recreational Services will make banks of lockers available for student projects at no cost and we are still working on a solution for larger storage of projects between working sessions. Makerspace Unit 190B extended until the end of the Summer 2018 semester. The securing of additional student space on the Surrey campus is also aligned with student sentiment that has been regularly expressed in Surrey. SFU will continue to work diligently to improve the student experience at the Surrey campus.